Howard Gould and his wife, actress Katherine Clemmons, purchased the estate property in 1900 and 1901; Castle Gould was the first of four mansions built here, designed by architect Augustus N. Allen in 1902, modeled after Ireland’s Kilkenny Castle. 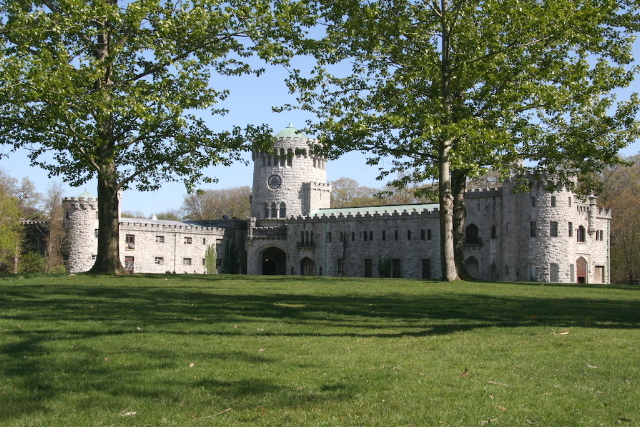 Completed in 1904, this impressive 100,000-square-foot limestone building was intended to be the main residence on the estate, but, when Katherine decided that it did not suit her, Howard proceeded to build Hempstead House. Castle Gould then served as the stable, carriage house, and servants’ quarters and now houses the Visitor Center, Great Hall, and a 7,000-square-foot New York State-certified sound stage – a.k.a. The Black Box. The Great Hall is accessed through the rotunda beneath the castle’s massive clock tower. Often used for private events, this space is a fully renovated multi-purpose room with great vaulted ceilings, wrought-iron chandeliers, plush draperies over enormous windows overlooking the Preserve’s grounds and the distant view of the Long Island Sound. Castle Gould is not open for tours, but the Welcome Center & Gift Shop and rest rooms are located under the clock tower. Many fitness classes (including After School Yoga), family nature programs, and cultural events take place inside its Great Hall.